HSSC Junior Engineer Recruitment 2019 Notification has been issued by the Haryana Staff Selection Commission on 7th January 2019. Haryana SSC online applications have started on 4th Feb 2019. It is a good opportunity for them who are waiting for an HSSC job. 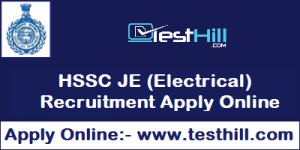 HSSC vacancy 2019 of Junior Engineer (Electrical) is very important for those candidates who have an electrical diploma. Candidates who are going to apply for this recruitment should have knowledge about HSSC JE recruitment 2019 syllabus. No fee for the Haryana Female candidates and ex-servicemen of Haryana.